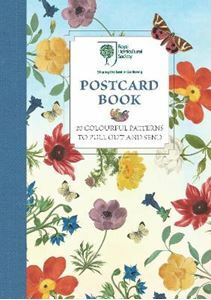 Quick overview These beautiful colour postcards, illustrated with artwork from the world-renowned archive of the Royal Horticultural Society, are perfect to keep and send to friends and loved ones. These beautiful colour postcards, illustrated with artwork from the world-renowned Lindley Library archive of the Royal Horticultural Society, are perfect to keep or send to friends and loved ones. The postcard book includes 20 beautiful full-colour pull-out postcards with space on the back for your message and address.